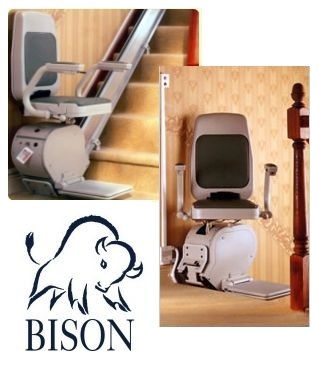 The Bison Bede Classic Stairlift was considered by many in the trade to be the Rolls Royce of stairlifts. With its reliable A/C or D/C controlled whisper quiet motor, it had no competition in its day! It had a large luxurious padded seat and armrests that all folded up neatly when not in use. A choice of upholstery colours were also available. These included Green, Blue, Brown and Coral. A long levered toggle switch was used to control the lift and was fitted on either arm depending on the user. It also came with call and send buttons which were fitted to the wall or newel posts at the top and bottom of the stairs and were used to move the stairlift up and down remotely. A set of 12 rollers with bearings made sure the Bison Bede Classic stairlift ran smoothly along its aluminium rail. This was one of the first stairlifts to offer a D/C powered option with remote controls.